If you are professional providing services, you know how difficult it is to find a decent office in the prime commercial area of your city. Rents of offices have skyrocketed in recent times forcing you to opt for a small space in a commercial building. However, there is no need to feel despondent over the fact that your office is very small. You can still impress your visitors if you furnish this small space in a creative and innovative manner. There are obvious disadvantages of having a small office space as you are forced to manage all your equipment and furniture within this area and you cannot even think of installing big and luxurious seating systems. But if you are creative and have flair, you can turn disadvantage into advantage and decorate your office to make it look beautiful. Measure the dimensions of the office space and list all the items that are absolutely necessary in it. You need to have smart ideas to avoid giving your visitors a feeling of a cramped office. Start with the paint on the walls and try to keep the shade light to give a feeling of wideness. You must buy corner desks that fit in the corners and free up lots of open space in the middle. Make sure that these desks have lots of shelves to hold your important papers and files. Think of all the equipment that you will keep over the desk and finalize accordingly. It should have space to accommodate your desktop and its accessories along with a printer and fax machine. 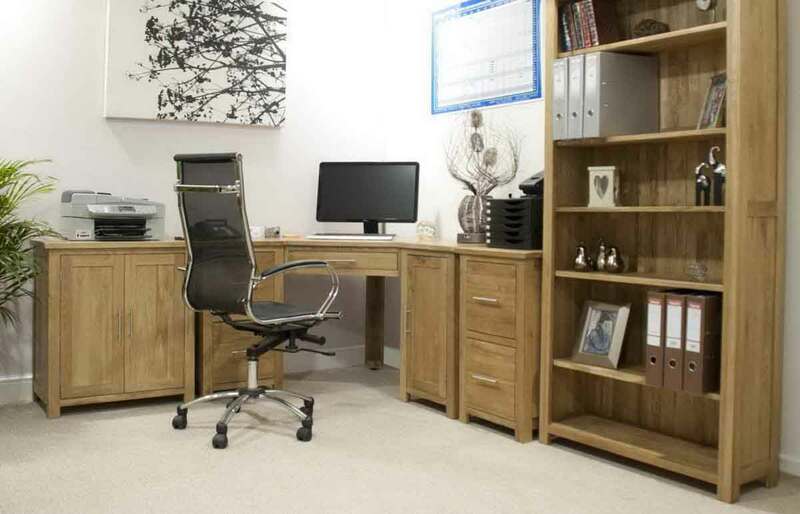 You can opt for small corner tables with cabinets for storage to give the impression of a workstation. The best way to give the impression of a large office is by choosing furniture items that can be positioned against the wall. This allows you to have a lot of empty space in the middle. You can make a small office space look big by arranging bright lighting conditions. Often people keep lighting low or insufficient that creates areas with shades. This gives your visitors a feeling of a cramped space. Fill the office with bright lighting and see the difference in not just impression on your visitors but also on the efficiency of your employees. Brightly lit offices look big and spacious while offices with low lights look small and cramped. While it is tempting to make maximum utilization of the space over the desks, you can actually give the impression of a small office if visitors find the desks of your employees cluttered and covered with all sorts of office equipment. Clean desks with desktops and only the most necessary papers and files gives the impression of a neat and clean office. Buy comfortable office chairs for your employees that can swivel to allow them to access files and documents easily. It goes without saying that a small office can start to look even smaller if you install cabinets and shelves that are all over the place. Instead, opt for vertical cabinets and shelves in the corners of the office. You can buy an aluminum ladder for your employees to retrieve important files and papers from these tall cabinets. Tripping over furniture in an attempt to find documents looks bad in front of the visitors. You can buy hang storage shelves that can be easily mounted on the walls of the office. Small office space dictates that you must buy only the most functional furniture items leaving ornamental and decorative furniture out of your mind.